Designer Dogs Dog Grooming Studio Respects Your Privacy! Any and all information collected on this site will be kept strictly confidential and will not be sold, reused, rented, disclosed, or loaned! Any information you give to us will be held with the utmost care and will not be used in ways that you have not consented to. We may, however, use your email address and home address to send you information about our site, products and service. A more detailed explanation about how we safeguard your personal information is described below. 1. Designer Dogs Dog Grooming Studio may employ other companies and individuals to perform functions on our behalf. They may have access to personal information needed to perform their functions, but will not be able to legally use it for other purposes. 2. 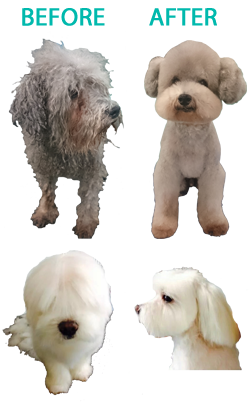 Designer Dogs Dog Grooming Studio may release personal information when Designer Dogs Dog Grooming Studio believes release is appropriate to comply with law, or to protect the rights, property, or safety of Designer Dogs Dog Grooming Studio, our users, or others. From time to time Designer Dogs Dog Grooming Studio may also provide aggregate (statistical) information to third parties to describe our services to prospective partners, advertisers, and other third parties, and for other lawful purposes. If Designer Dogs Dog Grooming Studio partners with another party to provide a specific service to you, and if you sign up for the service, then and only then will Designer Dogs Dog Grooming Studio provide your other information to such partner. Individuals must affirmatively ask to join our mailing lists using the forms provided on this web site or other means expressly sanctioned by Designer Dogs Dog Grooming Studio. We do not sell, rent, loan, trade, or lease the addresses on our list to anyone. Any information that personally identifies you or allows us to contact you, includes, without limitation, your full name, your email address, your home or business address, or your telephone number. This information is ordinarily used to individualize your experience on our website, communicate separately with you, facilitate your movements throughout our website, and to be able to selectively send you communications that may be of interest to you, either electronically or otherwise. Generally, you can visit our website without revealing any Personal Information about yourself. The personal information collected from clients at any time, is used to manage each client’s account (such as for clients accessing private content on the site). This information is not shared with third parties, unless specifically stated otherwise or in special circumstances. We collect certain Aggregate Information, such as tracking the Internet address of the domains from which you visit our site and analyzing this data for trends and statistics, tracking your IP address (the number that is automatically assigned to your computer when you are using the Internet), and tracking your browser type. We use this Aggregate Information to help diagnose problems with our servers, to administer our site, and to gather broad demographic information. None of this information is connected with your personal information. Designer Dogs Dog Grooming Studio may also generate non-identifying and aggregate profiles from personal information members provide during registration (such as the total number, but not the names, of clients). An IP address is a number that is automatically assigned to your computer whenever you’re surfing the Internet. Web servers automatically identify your computer by its IP address. Designer Dogs Dog Grooming Studio and/or its affiliates may collect IP addresses for the purposes of system administration, to report aggregated information to our affiliates, and to review the use of our website. When clients request pages from our website, our servers log the requesting clients’ IP addresses. We normally will not link IP addresses to anything personally identifiable, which means that clients’ sessions will be logged, but client identity remains anonymous to us. We can and will use IP addresses to identify a client when we feel it is necessary to enforce compliance with our rules or terms of service or to protect our service, website, or any person, or where it is otherwise permitted by law. When visitors or clients send email inquiries to Designer Dogs Dog Grooming Studio, the return email address is used to answer the email inquiry we receive. Designer Dogs Dog Grooming Studio does not use the return email address for any other purpose and does not share the return email address with any third party. We do not control use of these cookies and expressly disclaim responsibility for information collected through them. Please be advised that cookies may be required to complete certain functions on this website, such as making purchases or placing orders at our online store. Designer Dogs Dog Grooming Studio is committed to taking reasonable measures to protect your Personal Information from theft, misuse and alteration. Although Designer Dogs Dog Grooming Studio security efforts are consistent with industry practices, complete privacy, confidentiality, and security are not yet possible over the Internet. The client agrees that since the Internet is not a fully secure medium for the communication of information, and since privacy and confidentiality cannot be guaranteed, use of Designer Dogs Dog Grooming Studio services may cause the client’s information to be accessed by, or disclosed to, other persons. Therefore, the client agrees that Designer Dogs Dog Grooming Studio shall not be responsible or liable for any damage that the client, or any other person, may suffer in connection with the communication of private, confidential, or sensitive information using Designer Dogs Dog Grooming Studio products or services. While we make every effort to ensure the integrity and security of our network and systems, we cannot guarantee that our security measures will prevent third-party “hackers” from illegally obtaining the client’s information. Protecting children’s privacy is especially important to us. It is our policy to comply with the Children’s Online Privacy Protection Act of 1998 and all other applicable laws. Designer Dogs Dog Grooming Studio recommends that children ask a parent for permission before sending personal information to Designer Dogs Dog Grooming Studio or to anyone else online. If you have any questions about the security at our website, you can send an email to us. Any dispute over privacy is subject to our Terms of Service, including limitations on damages, arbitration of disputes, and the application of the law of British Columbia. While Designer Dogs Dog Grooming Studio will endeavor to email you with changes to either this Privacy Statement or the Terms of Service, you should check our web site frequently for any recent changes. If you have any questions or comments about the practices of this site, or your dealings with us, you may Contact Us. You can see some of my clients dogs, and read their reviews here.